PBS KIDS is springing into Earth Month with its annual Explore the Outdoors initiative, encouraging families to get outside and explore nature. The adventure begins on April 11 with brand-new episodes of the animated series READY JET GO! Then, on April 25, PBS KIDS kicks off an all-new week of WILD KRATTS and NATURE CAT, including the 100th episode of WILD KRATTS. 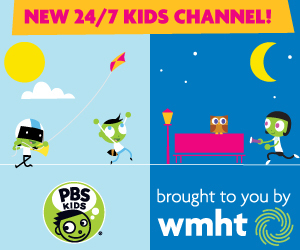 Programming will premiere on WMHT and will be available on PBS KIDS digital platforms. In addition, games and activities to engage the entire family in outdoor exploration will be available at pbskids.org/outdoors. To extend the exploration beyond the screen, PBS member stations across the country will host local community educational events throughout April. Across the country, more than 50 local PBS member stations will be hosting Earth Month-related events to connect children to the environment through hands-on learning activities. Events will feature everything from local ecology to urban hiking and biking trails. Families will also have the opportunity to dive into nature themes and environmental concepts with PBS KIDS Explore the Outdoors activities and materials. The READY JET GO! Space Explorer app launched today and is available for free on Apple, Google Play and Amazon. The READY JET GO! “Sydney’s Astro Tracker” game is now available on pbskids.org. New games from NATURE CAT and WILD KRATTS will be debut later this month. PBS KIDS Explore the Outdoors-related press materials are available on PBS PressRoom. “A Visit from Uncle Zucchini” – Celery's brother, Zucchini, and his pet, Moonbeam, decide to visit the Propulsions, but get lost along the way. The kids have to figure out where on Earth he is. As it turns out, Uncle Zucchini never made it to Earth, but has landed on a place that sort of resembles Earth — Titan, Saturn’s largest moon! Titan has Earth-like features such as oceans, mountains and an atmosphere. “Mindy’s Weather Report” – Mindy and Sunspot, watching a weather report broadcast on FACE 9000’s screen, learn of a huge storm system on Saturn. When the other kids hear about it, they mistakenly assume the storm is somewhere local. Mayhem ensues as the misinformation spreads and everyone rushes around to prepare, while Mindy meanwhile “broadcasts” her own weather report from Jet’s house. “Solar System Bake-off” – Mindy and Carrot are entering a cooking competition and they’re making desserts representing the different planets of the Solar System. But they hit a bump when they can't remember if Saturn is cold on the inside and hot on the outside or the other way around. Jet, Sydney and Sean fly with Celery to Saturn to find out before the competition begins, so Mindy and Carrot can finish their entry in time! “Kid-Kart Derby” – Jet builds an electric engine from scratch for the annual soapbox derby competition, but Mitchell, determined to win the derby, is suspicious that Jet is using some alien technology. “Asteroids, Meteors, and Meteorites” – Sean’s determined to beat his mystery competitor at a video game of “Astro-Tracker.” He realizes that the best way to learn about asteroids is to see them for himself. Celery flies the kids out to the Asteroid Belt, where they learn the difference between an asteroid, meteor and meteorite. Worried at first, Sean learns that only the rare asteroid (called a meteorite) makes it all the way to Earth, so he decides to become really good at “Astro-Tracker” to prepare for the future when he can be on a team of scientists who track rogue asteroids. “Mindy’s Meteorite Stand” – When Mindy and Sunspot are digging in the yard, they discover a unique rock that Mindy is convinced is a meteorite. The kids conduct a series of tests to find out, and amazingly the rock passes each test. “Meteorite fever” grips the neighborhood as Mindy sets up a stand so people can bring her rocks to assess. In the end, a scientist confirms that Mindy’s rock actually isn't a meteor, but the random rock Mindy’s sitting on is! “Mindy Pet-sits Sunspot” – Sean, Sydney, Jet and Carrot head out to view the Northern Lights. Mindy, upset she can't go, gets a boost — Sunspot stays back and agrees to let her be his pet-sitter. As the group in the saucer searches for, yet can't find, the Northern Lights, Sunspot and Mindy work on a backyard project — making their own amazing backyard “Northern Lights” display! “Treehouse ISS” – When the kids realize that they all want to use the treehouse at the same time for different activities, arguments break out. Mindy tries to help by creating a schedule for each kid to use the treehouse alone. In the end, the kids realize they need each other’s company and ideas in order to be successful in their own projects. In resolving their problem, the kids learn to think like the scientists on the International Space Station, who have to find a solution to the problem of getting along while doing different projects in a small space. When the Wild Kratts’ Tortuga is accidentally miniaturized and carried off by a coyote, the mothership’s shell defense is finally put to the test. The gang embarks on a box turtle-style mission to get back to the Miniaturizer and restore the Tortuga to normal size. It’s a relaxing day at Tortuga HQ when Chris comes in complaining about Martin. Confused, the gang soon discovers that Chris means a bird called the purple martin and not his brother! Chris is not happy about something else named Martin, and when a second creature called Martin comes along — he realizes it’s not his day. But soon, he comes to understand what awesome creatures these “other Martins” really are. When the Wild Kratts take time out for a swim, Jimmy reveals that he’s not that strong a swimmer. To help, Martin and Chris take him to his own personal swimming tutor — a sea otter named Coach! In the series 100th episode, Martin is hanging out with his pet fruit fly, Juice, when Juice suddenly dies. Even though Juice was young, he was pretty old for a fruit fly. Jimmy wants to know if any animals can live more than 100 years. Soon the Wild Kratts are on a mission to discover the oldest creatures on earth! When the Wild Kratts head out looking for black bears, Aviva keeps seeing a fleeting glimpse of what she thinks is a ghostly white bear. The gang soon realizes that they have stumbled across the rare Spirit Bear of the Northern Pacific. But celebration turns to dismay when they encounter new villain Ms. Paisley Paver, CEO of Pave Nature Incorporated, and discover her plans to turn the island into a mega-storage facility. “Earth Day Today” – It's Earth Day today! Hooray! To celebrate, Nature Cat, Squeeks, Daisy and Hal go on a nature hike to Butterfly Hills. But they don’t get too far because they keep running into plastic bags blowing in the wind. Upon closer inspection, they see these plastic bags come from a local supermarket, so Nature Cat calls for a change in Earth Day plans. Now they will celebrate Earth Day by alerting the supermarket to their plastic bag problem! “Earth Day Every Day” – With an earth-friendly alternative in place for the supermarket plastic bag problem, Nature Cat and his pals look to get back to their Earth Day hike celebration, but are once again sidetracked. This time it’s by a plastic bottle floating in a stream. Trying to get this one plastic bottle out of nature and into a recycling can takes them on a perilous, action-packed journey through the waterways, ending up in the ocean where they see more plastic waste! But it’s also where they learn that Earth Day is every day. “Kingdom of Rotting Log” – Sound the royal horns! Baa-baaa-baaaa! Today, Nature Cat, Squeeks, Hal and Daisy want to build their royal castle in the woods, for a day of royal play! But the build doesn’t go so smoothly because there is a rotting log in the way of where they want to put their castle. In trying to remove the log, our gang finds out how important rotting logs are. “Can You Dig It?” – Today, Nature Cat and his pals look to answer question number 73 on Nature Cat's Nature Curiosity List: If they keep digging a hole deeper and deeper, where will they end up? With the help of Daisy’s homemade Earthbreaker One machine and their imaginations, our gang goes onward and downward, through the earth, and winds up somewhere very surprising. “Mud Love” – To bring Hal's dream of Mud Appreciation Day to fruition, all his pals must lend a muddy hand, collecting different kinds of mud and setting up for the super fun and super messy celebration. But there is one slight problem, Nature Cat doesn't like mud and really wants no part of any of it! “Call It a Night” – While Nature Cat is playing flashlight tag at night, his hat falls off his head onto the ground, then surprises everyone by skittering off into the dark night! An already scared Nature Cat is now sad, worried that he will never wear his beloved Nature Cat hat again! They’ll never be able to find it; it’s so dark! Squeeks comes to the rescue with a great idea: to act like other nighttime animals and use some of their other senses to find it. “Woodpecker Picks a Place” – Nature Cat’s band practice keeps getting interrupted by a loud knocking on Hal’s doghouse. Upon investigating, the gang finds a woodpecker pecking away at Hal’s roof! In trying to stop the woodpecker to save Hal’s roof, and allow them to get back to band practice, the gang finds out more about woodpeckers and what exactly this one is looking for. “Here Comes the Sun” – Tally ho! Today, Nature Cat leads his pals on an amazing adventure, to see the Golden Sunstone! All is going well on the trek until Nature Cat accidentally breaks the compass! Uh-oh, now how are they going to tell which direction to go? As Nature Cat panics, Squeeks, Daisy and Hal find other ways to determine the right direction and save the day! The NATURE CAT series is a co-production of Spiffy Pictures and WTTW Chicago. Major funding for the series is provided by the Corporation for Public Broadcasting (CPB) and the Van Ekeren Family, founders of Land O'Frost.